With all the attention on the very low carbohydrate diet, and the importance of not consuming too much protein (becomes sugar when you exceed your body’s need) more attention is directed toward eating healthy fats. Raw nuts, seeds (whole or ground), coconut, avocado, and eggs lead the list of fatty superfoods. Tree oils such as olive and coconut are also healthy along with oils not commonly found such as grapeseed oil. Eating these foods raw ensures that the fats remain healthy, whether saturated or unsaturated. 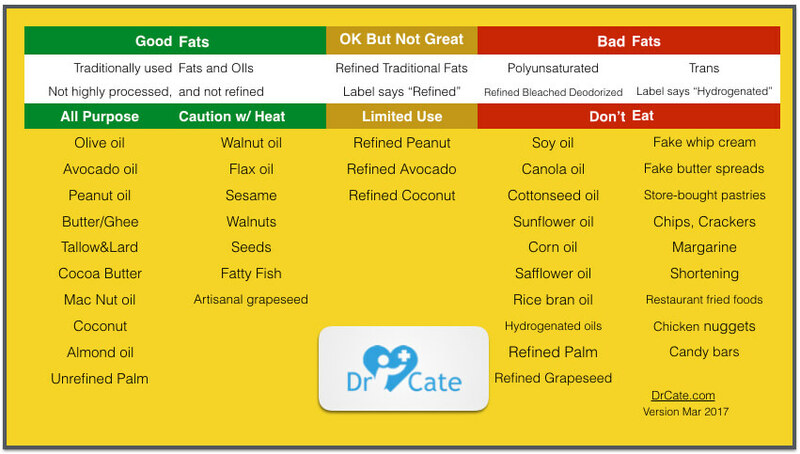 Unhealthy fats that cause inflammation in the body are trans fats and polyunsaturated fats from most vegetable oils. Cooking healthy fats may cause them to become unhealthy by hydrogenating the nuclear bonds and forming trans fats. This happens for example in the commercial cooking of French fries and many pastries such as doughnuts. Even olive oil becomes a trans fat in the skillet. Better choices to cook with are butter or coconut oil.